1. Preheat the oven to 180°C, gas mark 4. Rub the salmon fillets with olive oil and season. Sear in a hot pan, skin-side down, and then turn over and add the tomatoes, capers, olives and parsley. Place in the oven to bake for 3–4 minutes. 2. Meanwhile, start preparing the vegetables. Heat a ridged griddle pan. Cut the aubergines into 1cm slices. Place on the hot griddle pan in one layer and cook on a high heat for 3–4 minutes on each side until soft on the edges and marked with charred lines. Remove from the heat and leave to cool. 3. Slice the courgettes lengthways on a mandolin into very thin slices (about 3mm). Place in the griddle pan in one layer and cook for about 1 minute on each side, turning once, until they have nice charred marks on them. Remove and leave to cool. 4. Char the red peppers in the griddle pan until their skins are black all over. Put them in a bowl, cover with cling film and leave to cool for 10 minutes before scraping off the charred skin with a serrated knife. Cut the peppers in half and scrape out all the seeds. Rip the peppers into 2cm pieces and leave to one side. 5. Cut the tomatoes in half and toss with a good drizzle of olive oil, some salt and pepper and some torn leaves of basil in an ovenproof dish. Place in the oven and cook for 5 minutes. Leave to cool. 6. Remove the salmon from the oven and set aside. 7. In a bowl mix the 4 tablespoons of olive oil with the vinegar, a pinch of salt and some black pepper. Add the grilled vegetables and mix together, and then fold in the cooked tomatoes and some torn basil leaves. Check the seasoning. 8. 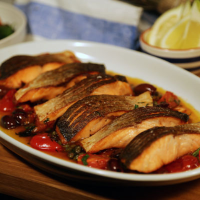 To finish, place the caper, tomato and olive mixture over the salmon fillets and serve alongside the grilled vegetables. This recipe was first published in May 2014.